After 15 years of telling lies for a living—writing novels and short stories—I’ve made a slight change of direction. Old Parker has always been a history buff, particularly reading about the heroic exploits and sacrifices of the brave young men who fought in World War II. So when Martin Olsen, a 91-year-old WWII veteran asked me to write his memoir, I decided to make the time in my writing schedule to help bring Marty’s story before the reading public. 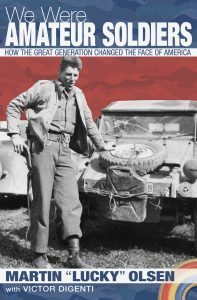 We Were Amateur Soldiers: How the Great Generation Changed the Face of America is the title of Marty’s life story, which begins with him growing up during the Great Depression, serving as an infantry man in WWII, and returning home to grow his father’s small business into a market leader. But it’s more than Marty’s story, it’s a history lesson of the “Great Generation” that supported the troops and kickstarted our economy, fueling an era of tremendous growth. I was recently informed that the book is a semifinalist in the Royal Palm Literary Awards competition in the Autobiography/Memoir category. Here’s the book cover, featuring a young Marty Olsen near the end of the war standing by a German jeep. If you look closely you can see the bullet holes in the jeep’s windshield. If you’d like to read We Were Amateur Soldiers, it’s available as either a print or ebook from Amazon.com. You know how one thing leads to another, don’t you? After Marty’s book was published I was contacted by another WW II veteran, and we’re now collaborating on a written legacy for him. I plan to continue telling lies (writing fiction), but I’m excited about working with others to help them capture their life stories and pass it along to their family and friends. Contact me if you know of anyone who needs my help, and maybe together we’ll craft a literary legacy from the pages of their life.